In 2011 alone, Marion handled an impressive seven contracts matters for Pro Bono Partnership of Atlanta clients. An employment attorney, Val started working with Pro Bono Partnership of Atlanta in 2006. Since then, she has contributed to 13 projects. Thomas has demonstrated his commitment to pro bono work by taking on numerous matters for Pro Bono Partnership of Atlanta clients – including five projects in 2011. He even arranged for one of his clients, a mentoring program for teenage girls, to tour Turner Broadcasting Systems’ studios. In a tough year for nonprofits, John was generous to contribute his bankruptcy expertise in several urgent client matters. A corporate attorney, Darcy was one of Pro Bono Partnership of Atlanta’s first volunteers. She has taken on at least one matter every year since 2005 and helps coordinate pro bono work in her office. Adrienne took on her first pro bono matter in 2006 as a new associate and has continued her commitment to Pro Bono Partnership of Atlanta ever since. In all, she has completed 15 matters while at two different law firms. AT&T is not only one of Pro Bono Partnership of Atlanta’s founding corporations, but their attorneys have contributed many hours to client matters. In 2011 alone, 12 volunteers assisted with 24 projects. AT&T volunteers have also played a significant role in our Nonprofit Legal Check-Up program. During 2011, 46 Sutherland attorneys completed matters for Pro Bono Partnership of Atlanta, providing pro bono legal services valued at nearly $200,000. Sutherland helped contribute the initial funding of PBP-Atl and has generously hosted our staff in their Midtown office for six years. Datacert donated their matter management technology platform, Passport, to Pro Bono Partnership of Atlanta. Passport has increased the efficiency of our work, allowing us to manage the increasing demand for our services without increasing staff size. 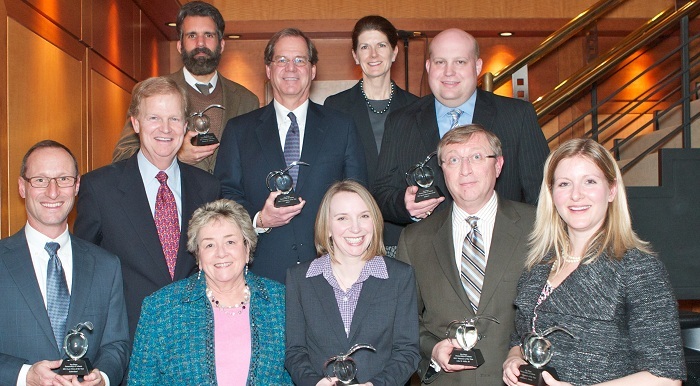 2011 marked the inaugural year of the Pro Bono Partnership of Atlanta’s Founders Award. This award was created in honor of Happy Perkins, retired General Counsel of GE Energy, who played a pivotal role in organizing Pro Bono Partnership of Atlanta. Happy served on the Board of Directors of Pro Bono Partnership of Atlanta for seven years and was an active volunteer with the organization. The Founders Award will be presented from time to time to recognize an individual who makes an outstanding contribution to Pro Bono Partnership of Atlanta.